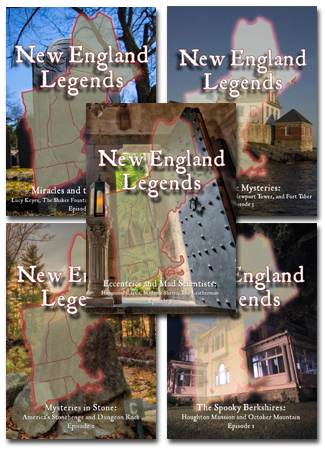 Jeff Belanger is a well-known and respected writer of the paranormal and the unusual. Each book he writes is educational and entertaining, and his research is accurate and superb. In his latest book, Picture Yourself Legend Tripping, the reader is given a guide to finding ghosts, UFOs, monsters, and other things. Jeff, it is a pleasure to interview you about the topic of legend tripping! You have certainly written an intriguing book. The research involved must have taken some time… did you find the research more involved than for your previous books? Jeff Belanger: Picture Yourself Legend Tripping has been many years in the making. This is not a new idea, of course. The concept goes back for thousands of years. The idea is to actively pursue legends. Folklorists have been using the term “legend tripping” for many years. It originally meant ostension — to sneak out, break the rules, and try to tempt something paranormal. I’m redefining the meaning. This time we do have permission, we’re not breaking rules, but we are still having a bold adventure. The concept of legend tripping is the evolution of my views on the paranormal, having studied this field for 15 years now. I was getting frustrated with the drama and problems I saw becoming so prevalent in the paranormal community. Legend tripping is my own return to all of the elements I love most about this subject: the story, the legends, talking to others about their brush with the unexplained, and my own experience once I’m inside the legend. What inspired you to create this special, highly readable “guide”? I want legend tripping to be a movement. Something that resonates with a lot of people, that spurns them to get out and dive in to the legends that are lurking everywhere. Every movement needs a starting point, so the book is that. Plus I launched a new Web site: www.legendtripping.com, to support the movement. The response so far has been incredible. My hope is that other authors will write books about legend tripping, that television shows will form around the concept, and people will be proud to identify themselves as legend trippers. I can’t make a movement on my own. The book is just the first step in an endless journey. Were there some parts that sparked your interest from past investigations? Sure. All of my past investigations helped shape who I am and what I believe. I thought a lot about my first time exploring the Catacombs of Paris, France. How I went in alone. No ghost hunting gear, just me, the history, the sights, the sounds, smells, and the human experience. And I actually saw something. I want most of my legend trips to be like that… and there’s no reason they can’t be. I get excited by looking for this stuff. You have a knack for coming across all things macabre and curious. Were you born with this talent, or did it develop along the way? I’ve always had a love for the weird. But I’m especially interested in the human experience — my own and that of the eye witness. After doing this for a bunch of years, I’ve developed an eye and ear for these kinds of stories. Plus people know I’m out there doing this and so I’ve become a magnet for strange stories. I think I have the coolest job in the world. You would say then, that everybody can become a legend tripper, if they wish? If people are reading this on Ghostvillage.com right now, my guess is they already are legend trippers. But yes, anyone can be a legend tripper. Just look into a mirror and repeat after me: “I’m a legend tripper.” There you go, now you’re in the club. Anyone who has ever even watched a paranormal television show is legend tripping, albeit the most passive form of the pursuit. To discuss a legend or to study its origins is still legend tripping. But for the full experience, you need to get out there and walk where Bigfoot was said to walk, you need to crawl through that creepy haunted building, and you need to talk to the witnesses. Finally you need to breathe in the legend for yourself and see what happens. No equipment is necessary beyond what you have on you right now. Your book comes with a fascinating DVD. How did that come into being? It’s amazing what can happen when you have some beer, a video camera, and some willing friends. The publisher wanted a DVD included with this book. Considering how visual legend tripping is, it made sense to show what this can look like. I was also fortunate to interview some great paranormal colleagues including: Loren Coleman, Peter Robbins, and Nick Redfern, plus some of the crew members from my 30 Odd Minutes show helped out as well. To me, personally, chapters two and five held great appeal because they concerned ghosts and UFOs. Did you find UFOs a difficult section to research, or was there an abundance of material available? UFOs have always fascinated me because it poses a big question: Are we alone in the universe? There’s an abundance of research out there, so finding the information was not that difficult. But redefining the quest for UFOs within the realm of legend tripping took some work. For the book I interviewed some folks from MUFON — the Mutual UFO Network — which is an amazing and organized group. BUT… while I applaud their thoroughness of data collection, I feel like they sometimes miss the point and overlook the story, the legend, and the human experience. I love stories of UFOs and abductions. I want to see the photos and videos. But I also want to go to the landing sites and talk to the witnesses myself because the legend of that sighting doesn’t end when the flying object disappears. The legend goes on for as long as we talk about it. Do you see the possibilities of a documentary film or movie about your book? There are limitless possibilities with legend tripping. I’d love to see a television show developed around the idea. Where we can delve into great local legends, meet the witnesses, see some reenactments, and stand where the legends stood. Like politics, all legends is local. It’s such a visual and active pursuit that visual media would lend themselves well to this subject. In addition to nonfiction and children’s books, do you foresee the time when you will write an adult fiction book? Do you see yourself becoming a novelist? You never know! I’ve written a novel for children (that wasn’t picked up by a publisher). And I’ve started a paranormal novel for adults, but I got sidetracked with other projects that were bringing in steadier paychecks. It’s something I’d love to get back to someday. But for now, I’m definitely living the dream. How were you able to gather such a wonderful, eclectic collection of photos and drawings to accompany the text in your book? The Beatles put it best: I get by with a little help from my friends. I’m fortunate to have such a great network of paranormal friends and colleagues (legend trippers one-and-all) who are so generous when it comes to sharing information, cases, and even photos and drawings. Jeff, is there a further comment or comments you would like to share with the readers? I regret that I have but one life to devote to legend tripping. Click here to buy this book now.